Shawnee Mission West earned its rematch and will try to take down class 6A No. 1 Shawnee Mission East on Friday. In their first meeting, the Lancers won in convincing fashion with a 42-19 win in Week 4. Shawnee Mission East has yet to play a four-quarter game. They have outscored their opponents 448-97 and have scored at least 35 points in every game this season. The Lancers scored 35 unanswered points after falling behind 7-0 to Lawrence to advance to this quarterfinal matchup. SM East has favored the run over the pass all season. In the win over Lawrence the Lancers rushed for more than 400 yards and attempted only one pass. Wyatt Edmisten and Jackson Gossick led the ground attack for East with 150 and 124 yards, respectively. Edmisten is over 1,000 rushing yards on the season with 1,074 and 23 touchdowns. The Lancers are very capable throwing the ball if necessary. Quarterback Gunnar Englund has thrown for 1,176 yards and 19 touchdowns this season. His primary target has been Alec Dean with 498 yards and eight touchdowns. The Vikings have turned things around after their 1-4 start. Winning its last five contests, Shawnee Mission West advanced with a 26-20 slugfest against Olathe South and avenged its 31-21 defeat against the Falcons earlier in the season. Backup quarterback Jonathan Shull scored on a short touchdown run with 13 seconds remaining to lift the Vikings to win. A similar situation presents itself on Friday, only this time they will face an emerging powerhouse in 6A. The Vikings are led by Tarik Watson who has rushed for 1,004 yards and seven scores.SM West will need to control the line of scrimmage, but more importantly the Vikings must stop East on first and second down and get them in third and long situations. The Lancers have been cruising all season and it doesn’t stop on Friday. Two of the top-ranked teams in Class 6A all season will clash in the quarterfinals. The third-ranked Blue Valley Tigers enter this matchup on a seven-game winning streak since falling 42-21 to Bishop Miege in Week 3. Blue Valley has boasted a strong defense, allowing 14 points or fewer in eight of 10 games. The Tigers jumped out to a 38-0 halftime lead en route to a big victory over Shawnee Mission South last week. Will Evans rushed for 152 yards and three touchdowns. Evans leads the Tigers with 1,003 rushing yards and 16 touchdowns. A.J. Totta has added 781 yards rushing and ten scores, while quarterback Colton McCumber has added more than 600 yards and eight scores. McCumber has passed for 984 yards and eight touchdowns. Blue Valley senior offensive lineman A.J. Harris has verbally committed to play for the Missouri Tigers. The second-ranked Olathe North Eagles squeaked by in their first three games of the season but have mostly dominated since then. Olathe North opened the season by beating Rogers-Heritage (Ark. ), Lawrence Free State and Olathe South all by seven points or fewer. The Eagles suffered injuries to two quarterbacks in the season-opening win at Rogers-Heritage. Starter Cole Murphy has returned and has the Eagles rolling. He’s thrown for 829 yards and nine scores on the season. Running back Venus Triplett has rushed for almost 1,200 yards and scored 20 rushing touchdowns. Jeighlon Cornell is the Eagles’ leading receiver with 347 yards and four scores. These two football powers last met in 2009 when Olathe North won a pair of games against the Tigers. The Eagles won 49-35 in the district meeting and 16-14 in the sub-state semifinal. The Tigers won the only meeting the year prior, 42-41. Derby and Hutchinson meet for the second time is season with a trip to the class 6A state semifinals on the line. In their first meeting, the Panthers built a 35-7 lead over the Salthawks and withstood a late Hutchinson comeback to win 35-28. Since dropping its season opener 20-13 to Maize, Derby has rattled off nine consecutive wins. During their win streak, the Panthers have scored at least 35 points and have defeated every team by at least three touchdowns besides its seven-point win over the Salthawks. Curtis Whitten rushed for nearly 100-yards and three touchdowns in his first meeting with the Hutchinson defense. Hutchinson looks to continue where they left off with Derby in week four. They scored 21 unanswered points in their first meeting with the Panthers but ran out of time before having a shot to tie the game. The Salthawks were led by Blaik Middleton who rushed for 156-yards and quarterback Turner Wintz who rushed for two touchdowns and threw for another in their seven-point defeat. Middleton has been exceptional this season. The Dodge City transfer has set a Hutchinson single-season rushing record with 2,097 yards and has scored 30 touchdowns. In his last four games, Middleton has rushed for more than 1,100 yards and 19 scores in his past four games alone. I expect this game to go down to wire and whichever team wins the turnover battle will advance to the semifinals. I like Derby at home. Free State and Junction City meet in what is sure to be a very competitive game. The Firebirds turned away Wichita Northwest 27-16 to advance, while the Junction City grinded out a 17-6 win over Wichita West. The two have a common opponent in Manhattan. Free State defeated the Indians 35-14 in the first week of district play while the Blue Jays fell 16-7 the week before. Lawrence Free State’s defense kept bending but never broke as Wichita Northwest was only able to put points on the board on two of six deep trips into Firebird territory. Two of Free States’s three losses came to the No. 1 and No. 2 ranked teams in 6A, while the other came to a 5A quarterfinalist in Leavenworth. The Firebirds are in a midst of a five game winning streak and have held their opponents to 16 points or less in four of them. If the defense holds, Free State will advance. 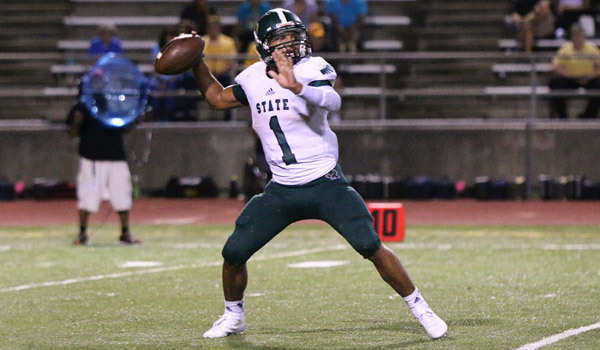 Free State is led by dual-threat Bryce Torneden who has a chance to become a 1,000-yard passing season to go along with this 1,101 rushing yards. Junction City enters the quarterfinal matchup with an 8-2 overall record and is receiving votes in the latest class 6A poll. The Blue Jays pride themselves on defense giving up a combined 26 points during their four-game winning streak. However, I think the result will be determined on the other side of the ball. When Junction City’s drives enter Free State territory they must end up in points.